19,000 people fit into the new Barclays Center to see Jay-Z perform. This blog was viewed about 160,000 times in 2012. If it were a concert at the Barclays Center, it would take about 8 sold-out performances for that many people to see it. On Saturday, college football fans were treated to a gridiron classic, as Alabama defeated the University of Georgia 32-28 to capture the SEC Championship and a trip to the NCAA national championship game. Spectacular individual and team performances drove the fans to parallels of euphoria and bitter disappointment, depending on which team was their favorite. This was the zenith for college football and the young athletes who play the sport. Shorter football appeared recently on a regional cable network. It got the Shorter name out to potentially thousands of viewers. Perhaps there were some high school students and parents who looked further into Shorter. They may have viewed a catalog to see what academic majors are being offered. Problem is, in these changing times at Shorter, what is in a catalog and what is really being offered might be entirely different. I mentioned academics in a sports article again, but at some point the strength and conditioning of the academic aspects of the school must be studied. (Note that I used a sporty analogy, which keeps me on track in fleshing out my theme). As December rolls around, the college bowl season is set to begin on the national stage. In the classroom, students will take final exams to cap off their academic seasons. And for Shorter University, another outcome will be decided on December 11th, as the SACS report and recommendations for Shorter will be announced. Will that announcement be followed by the thrill of victory, or the agony of defeat? It will depend on how many of the abundant fouls and penalties committed by the Shorter administration were observed by SACS officials as a result of their April visit. Will we see a flag on the play? Just how well did Shorter implement their game-plan of deception? How closely were the officials watching those plays? If those charged with creating whole cloth from nothing were not able to “clean up” the little messes noted in the April visit, Shorter may be on the path to an eventuality that will put them in with the big athletic programs – probation. However it will not be an athletic one, it will be an academic one. And I will not apologize for THIS mention of a scholarly term! New enrollment for fall 2012 was at least 208 new students. And enrollment is only down a little bit. This season of the year provides us all the opportunity to give thanks for things that are important to us. I would like to list some things that I am thankful for, as well as some things that others MUST be thankful for. – SOS, for continuing to shed light on shadowy behind the scenes maneuvering at Shorter University. – Past faculty and staff for establishing an educational legacy and traditions that, until recently, carried over the decades. – Current faculty and staff that remained through the recent upheaval to provide some continuity to upper-class students. – New faculty, for doing their best in positions that many were not yet qualified for at this point in their educational journey. – Alumni who care about Shorter enough to point out the slippery slope of academic obscurity that Shorter could be headed down with just a few more “edicts” or “sound decisions” by the Dowless administration. – The Messengers who attended the recent GBC annual conference and also represented SOS in a dignified manner. Yes, many of us are Baptist and some are GBC Baptists. These Messengers also were able to listen to and videotape Don Dowless giving his “State of Shorter” speech to the Educational Committee of the GBC and the Annual Meeting attendees as well. – Nelson Price, for bringing him to Rome, Georgia and giving him a thriving University to play “school” with. – An ability to sell Shorter as a school that had “strayed” from the Godly path. This has served him well speaking to fundamentalist supporters who do not care about the quality of education, as long as the Bible is involved. – The athletic department, for serving as the object of his adoration. In the face of academic upheaval this acts as a great diversion when speaking to the public. – The GBC, which supports his every move and seem hell-bent -er- determined to make sure Shorter serves as a Sunday school-missionary-fundamental whirligig of academia. – For President Simoneaux of Brewton –Parker College who spoke of his schools increased enrollment and presented his school in a positive and dignified manner. – For President Caner of Truett-McConnell, who also spoke of increased enrollment with statistics to back it up, while also speaking of traditional marriage and family values with such fervor that rounds of spontaneous applause errupted. – For President Dowless of Shorter University, who spoke of pride, pride, and…well…PRIDE. When prompted, the audience clapped politely. He also spoke of enrollment, presenting a figure of 2972 under the umbrella of Shorter. He failed to mention that this is a DECREASE of 730 students. However, this must be acceptable because he is so PROUD of the numbers. Nowhere in his address did he make mention of any academic accomplishment, save for the softball team’s scholastic prowess. Thanksgiving is also a time to pray for those less fortunate, and at Shorter this would be the students. Many upperclassmen are just trying to finish and get out. I pray that they will recall enough positive memories from their time at Shorter to offset the train wreck from the past year that was ushered in by the “New Shorter Order”. I pray for the freshmen who have little idea of how Shorter was just a short time ago, except for the brochures they read that featured those students, faculty, and staff who made up the Shorter University they THOUGHT existed. Our former academic stalwart is in hibernation, and we must all pray especially for alumni and friends to care enough to take an unflinching stand that will allow Shorter to re-emerge as a Christian university that is athletically AND academically sound. In September, over 50 SOS supporters met in Atlanta and Rome with Libby Nelson, a reporter for Inside Higher Ed, the number one online magazine for educators. In an article out today, she recounts Shorter’s last turbulent year. You may read the article by clicking here. Our thanks to Ms. Nelson and to Inside Higher Ed for its interest in documenting our story. Yesterday, November 13, the Georgia Baptist Convention held its 191st Annual Meeting. Contrary to what may be believed, a number of our SOS members are Baptist and have a rightful voice at the gathering, so we thought it fitting for SOS to have its name represented at the meeting. Over 200 of these fans were passed out to meeting messengers. Many asked what we wanted to “save Shorter from”. If you are here because you “followed the fan”, welcome! On these pages, you’ll learn exactly why we want to save Shorter. Dr. Don Dowless said was proud to represent Shorter to the gathered attendees. Unfortunately, his audience was not as large as he might have liked. In the years before the Fundamentalist takeover of the GBC, large arenas were rented to accommodate the crowd. As we reported yesterday, the GBC membership has fallen severely. Our messenger reports that there were only around 500 in attendance at any given time yesterday. The video linked here of Dowless’ comments was provided to SOS for our readers. There are a number of issues that should be of concern to our readers and to Georgia Baptists especially. Dowless begins his report by saying “Is there anybody here that doesn’t know where Shorter University stands?” We suppose that Dowless was expecting a standing ovation or at least a loud cheer. He didn’t get either. He reports that “we are thriving – doing the best we’ve ever done.” The loss to date of 90 employees, with more to come, calls that statement into question. When 4 deans, several vice-presidents, a number of department heads and your recently hired human resources director walk out, something is wrong. Dowless reports an enrollment at Shorter of 2,972 students. According to the Shorter Fact Book 2011-12, last year, Shorter’s enrollment was 3, 702. Total loss – 730 students. And yet, Dowless reported to the Board of Trustees that enrollment was only down “a bit”. The number he gave to Libby Nelson, in the article linked above, was 115 students. Readers, statistics don’t lie. Dowless reports that the administration has stood firm and done it “in a loving, good spirit”. Michael Wilson would differ with that. Scores of alumni who tried to talk with Dowless would differ with that. Former students who sought an audience with Dowless would differ with that. Community leaders and donors who talked to Dowless would differ with that. He mentions the School of Nursing. He doesn’t bother to say that they lost the Dean of the School of Nursing to Berry College. He doesn’t mention the fact that his new dean had only 2 semesters of teaching and had just received her doctorate. He says nothing of the fact that students are desperate because they are being taught faulty science and because they’re having to teach the teachers. He doesn’t have a clue how many are planning to leave. What he DOES know, however, is that the students will be sent on mission trips. The remainder of his message- part report, part sermon – is about mission trips and athletics. Only once, in the entire presentation, does he mention academic excellence and that as a passing reference to the softball team. Not once does he point to academic achievement in the business, education, science, communication arts or fine arts schools (Perhaps that’s because the fine arts school is nearly non-existent). In fact, the word “academic” is heard only once. The one thing that Dowless does mention, however, and mentions often, is the word “proud”. “We’re proud to be a Georgia Baptist University . . .We stood on our values and we’re proud of it. . . We’re proud to say we’re a Georgia Baptist school . . . you ought to be proud of us too. . . (named in the Princeton Review) we’re proud of that. We’re proud that our nursing school has 83 students in it. . . I want you to be proud of Shorter University. I want Christ to be more proud of us. There is a lot of “I” and “we” have done, but little that shows any humility for what has happened at Shorter. Dowless never gives credit to God for what has occurred at Shorter. Perhaps that is because what has happened is not of God, but of man. His thanks to the Georgia Baptists is cursory at best. He thanks his Board of Trustees not at all. Perhaps that is because the board has become filled with figureheads at best. His report is all about what he has done. When ego supplants Divine authority, it does not bode well for Shorter. 11/13/12 Be sure to check in for tomorrow’s post. We will be recapping Dr. Dowless’ address to the Georgia Baptist Convention and give you our response. There will also be a special feature that you will not want to miss! Tonight, the Georgia Baptist Convention began its 191st Annual Meeting at the Second Baptist Church in Warner Robins with an Inspirational Rally. Leading the program were GBC President, John Waters and GBC Executive Director, Robert White. Tomorrow evening, faithful Messengers will gather from all over Georgia to hear about the state of the GBC , to celebrate its various accomplishments and to be charged, once more, with carrying out the Great Commission. Most likely, what will NOT be discussed is the decline of the Southern Baptist Convention in general and of the Georgia Baptist Convention in specific. In June, it was announced that membership in Southern Baptist churches had declined for the fifth straight year. The statistics for 2011 showed that membership had dropped to less than 16 million – a statistic that had not been seen since 2000. Baptisms are also down – drastically. The Georgia Baptist Convention is in acute budgetary distress. At last year’s November convention, Robert White called on Georgia churches to increase their Cooperative Program giving by 1%. Keep in mind that the GBC keeps approximately 60% of every CP dollar. The average giving from GBC churches nowadays is less than 5%. By February, the GBC was announcing its fourth staff downsizing since 2009, calling it the most drastic cut yet. Discussions have been underway for quite some time about selling the $42 million dollar albatross that is the GBC headquarters (think of how many mission projects that much money could have supported). Perhaps Robert White’s exhortation has been heard, and then again, perhaps not. As recently as May, the Consolation Baptist Association passed a resolution calling for all GBC churches to cut funding to the Cooperative Program in order to keep all donations within the Convention itself. With the changes in the GBC’s Church Planters Assistance Policy, new churches now are only required to support the Cooperative Program by giving 5% instead of the formerly required 10%. This move, we imagine, was only made in order to keep the new churches aligned with the GBC. In any case, the new changes seem to affirm the Executive Committee’s realization that 5% giving may be the new normal. The Annual Meeting promises to be a rally for the cause of Fundamentalism. Perhaps the idea of supplanting the old Southern Baptist name and claiming the new Great Commission name will take hold. That will make no difference to the Fundamentalist agenda. No matter what the name, the objectives of exclusivity and control will be the same. Without doubt, the Messengers will hear great stories of missioning and evangelism. Calls will go forth for more faith, for more proselytizing, for more giving. The intention is to send the Messengers back home with a revitalized commitment to the GBC and to the rightness of the Fundamentalist values. If the current trends are predictors of future behavior, those calls will have limited effect. The GBC simply can’t replace thinking individuals with those who mindlessly follow the dictates of Fundamentalist leadership fast enough. What does all of this have to do with Shorter? Despite protestations to the contrary, Fundamentalism is in an increasingly rapid decline and carrying the Georgia Baptist Convention and the SBC with it. The more stiff-necked the leadership becomes, the less effective their evangelism efforts. The more they speak of their New Earth theories, the rigidity of inerrancy as interpreted by the SBC alone, the more they deny the genetic factors that point toward the nature of homosexuality, the more they fight among themselves over Calvinist doctrine, the more they separate themselves from fellow denominations and imply there is no place at their table for those who think differently than they do, the more unattractive they become to potential converts. When you can’t recruit by evangelism and exhortation, when your coffers are rapidly growing smaller, when former allies walk away in disgust, where do you find your potential membership? You take over the halls of academia and force your beliefs on young minds. Instead of gathering converts who willingly gather at your table, you control every facet of education.You indoctrinate those young minds. You have been entrusted to provide your students an academically rigorous education, where open inquiry is the hallmark and academic integrity is valued. Instead, you ignore academic principles in order to ensure future donors for your coffers. You tell your churches that it is their duty to support the colleges and universities you control by sending their dollars and their children to uphold the cause of Christ. You purge the faculty of anyone who does not swear allegiance to your values. And you do it all in the name of Christ. In other words, you pervert academia for your own purposes, few of which are Christ-centered and all of which support the power at the top. When you preach God’s word in the light and with truth; when the love and acceptance of Jesus Christ at the forefront of the message, people cannot help but flock to you. So it has been for centuries. When creedalism, bigotry, narrow-mindedness, condemnation and greed take over, people leave. From the SBC, from the GBC and from Shorter. GBC Messengers, you have an obligation to a much higher power than that which sits in the GBC offices. Christ calls us to be disciples of His truth and His love. Wash the clouds from your eyes; dare to speak out and demand the truth – from your pastors, and from those whom you elect. It was Christ’s way to challenge authority. Make it your way. “I am the way, the truth and the light.” He said to his disciples. 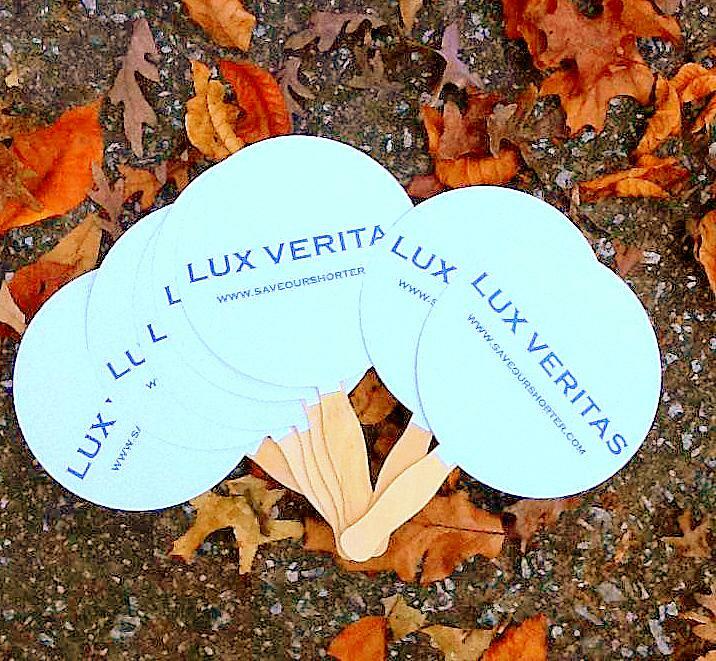 Bring back LUX VERITAS. Bring back truth and light. GET OVER IT? NOT A CHANCE! As a graduate of Shorter College, I have written before of my strong feelings for my alma mater and of those who nurtured the college over the decades. It was those individuals who worked to make Shorter a superior institution of higher learning. I am turning my attention today – All Saints Day – to some comments that have been made in response to recent posts on this website, and the thoughts that have occurred to me. While I noticed numerous comments of warmth and support for those no longer on the Hill as well as for those that remain, I have also read comments that convey the opinion that we at SOS should forgive, let things go, and move on. While these were made mostly in a friendly context with no hint of ill will, Let me share the reaction that those comments stirred up in my own heart and mind. I forgive those who are now in charge at Shorter; who have wreaked havoc on the lives of so many Shorter students, faculty, staff, alumni, parents and supporters. I forgive the ignorance revealed by their insistence that the school had “strayed” and needed to be whipped back into shape. I forgive their insistence that there needed to be a new beginning for Shorter, a sort of “Baptist-ism”, if you will. For Don Dowless and his administrative cronies and trustee emeritus Nelson Price, this entails backstabbing, unjustified firings, half-truths, non-truths, and all sorts of cunningness, all disguised behind the righteous cloak of Christianity. I do not like this, but I forgive. The ever present photos of Don Dowless with a half-smirk – half-frown with arms folded, as though he has conquered our world, I forgive also for the Baptists need a hero to laud. Remember, we are not to hate the sinner, but hate the sin, and that, I truly do. There is an old slogan used on memorabilia that celebrates the old rebel South: “Fergit hell!” That is what I feel as I ponder the notion of letting this go. I think of so many men and women of strong moral fiber –those who set the course of Shorter long before the current administration and Fundamentalist GBC came along; leaders who taught us the way through true Christian higher education, recent leaders who chose to stay at Shorter to try to help steer the ship through these choppy waters. I think of how so many of them have been fired because of the “different direction” that was being taken – or whatever the excuse was for that particular week. I think of a renowned music program that has been almost leveled, and I think about the faculty and the few students that are charged with keeping the shambles of the program that remains moving forward. I think of the theater program that has been neutered by censorship, yet the handful of students and a battered but determined faculty trudges forward. I remember some alumni who expressed grave concern about the new direction of their alma mater until they were appointed to the Alumni Governing Board. I cannot forget how quickly they were charmed into falling in line behind the “new direction”. It no longer seemed to matter that the new direction either ignored or worked to squelch any voice that dared to speak out in opposition. Nor does it seem to concern them that the old alumni – their classmates and friends who helped to build Shorter’s traditions, are the ones that were giving voice to that opposition. I know that if I visit the campus I will be reminded of the “new” Shorter because of the library addition that bears the name of Nelson Price. Never mind that this man has no academic ties to Shorter, who despite being a Georgia Baptist preacher for over 35 years at a church only an hour away, actually had to ASK FOR DIRECTIONS to the campus the first time he visited Shorter…after he was appointed as a TRUSTEE! I am told that our degrees will be of greater value because of all the things this man has done. But it is hard to believe this because I know so many things that have transpired behind the scenes – things in which he had a hand – to make these changes, this new “Holy Shorter” possible. It seems that one of their new traditions will be holding Trustee meetings in the buildings of the departments that have been hardest hit by the new regime. A sort of “hail the conquering hero” move is afoot. The BOT recently held their fall meeting in the Fine Arts Building. Will the spring session be held in the Science Building? I went to Six Flags with friends recently. We waited in lines for the roller coasters. One line in particular had us waiting for over 2 hours. We would stand still, walk a few steps, stand still, walk a few steps, and it crossed our minds more than once that we ought to get out of line and do something else. We chose, however, to stay in line, and were rewarded greatly. Pointing out the misdeeds at Shorter, and fighting for a better Shorter that does not operate unethically is similar to standing in that line. Our work here might be slow, it might sound crazy, it might get boring, but the reward at the end may be an exhilarating ride! It could be a ride that watches Shorter move away from the current unethical behavior that will ultimately cripple an influential university. It is our belief that Shorter could become an institution that borrows from the past, integrates an inclusive, loving Christian atmosphere in the present, and has a healthy leadership structure that will allow her to soar like the namesake of the ride we rode at Six Flags…Superman! In any case, SOS is not going away. While we ask God to help us forgive, we are not going to forget and we are not going to move on. Nelson Price told the Board of Trustees that the negative response to their actions on the Hill would blow over in a few weeks. It did not. He then promised that we would come around in a few months. We did not. A year later, we’re still here, we’re still watching, and in memory and in honor of all the saints from the Hill that have gone before us, on this All Saints Day we declare that we are here for as long as it takes and will be documenting what is happening to our Shorter every step of the way.